Pre-cooking pasta allows you to do the bulk of preparation before a dinner party. When party time rolls around, you only need to reheat the pasta with a quick plunge into boiling water. Restaurants use this technique to get pasta entrees to the table faster. Pre-cooking also works well to shorten the cooking time for noodle casseroles, such as lasagna. Use pre-cooked noodles in the casserole and you won't have to cook it as long. Bring water to a rolling boil in a large pot. Use a pot large enough for the pasta to float in the water. This helps ensure even cooking. Add the pasta to the boiling water. Eight oz. of dried pasta equals about four servings of cooked pasta. Stir in ½ tsp. to 1 tsp. of salt, if desired. Add 1 tsp. olive oil to the pasta in the water. This helps prevent the pasta from sticking together and breaks the surface tension of the water so it's less likely to boil over. Stir to mix in the oil. Boil the pasta until it is almost, but not quite done. How long this takes depends on the type of pasta and the altitude at which you're cooking. 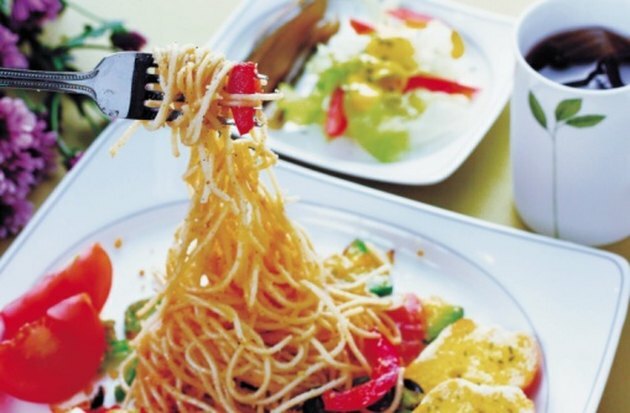 Remove a piece of pasta from the boiling water, let it drain and cool slightly, then test it by biting into it. It should give but still be underdone in the middle. The pasta will cook more when you reheat it. Drain the pasta in a colander. Store the pasta in a sealed container until you're ready to use it. Reheat the pasta by putting it in boiling water for a couple of minutes. Drain and serve.